JAMMU, APRIL 16- Deputy Chief Minister, Dr Nirmal Singh today said that culture is one of the most important parameters of human living as it imbibes the sense of belonging to a particular region and the need of the hour is to ensure its preservation and propagation. Deputy Chief Minister was speaking at a mega event Duggar-dey-Rang season-II organized by group ‘The Performers’ at Kala Kendra. Minister of State for Education and Culture, Priya Sethi was also present. Several prominent social activists and journalists including Mamata Singh, Suhail Qazmi, former Ministers, legislators and Secretary Cultural Academy, Dr. Aziz Hajni also attended the event. Deputy Chief Minister said that the government is doing its bit in ensuring proper projection and propagation of our rich heritage as well as cultural traditions adding that now the onus lies on the people, several cultural organizations to supplement the efforts. He said that several cultural programmes and festivals of international repute have also been organized in the recent past, which provide much needed platform to our upcoming talent to perform alongside several prominent and legendary artists of the globe. Dr. Singh while complimenting the organizers for showcasing rich Dogra Culture said that more such events should be organized it would ensure the propagation of rich cultural traditions especially among the younger generation. 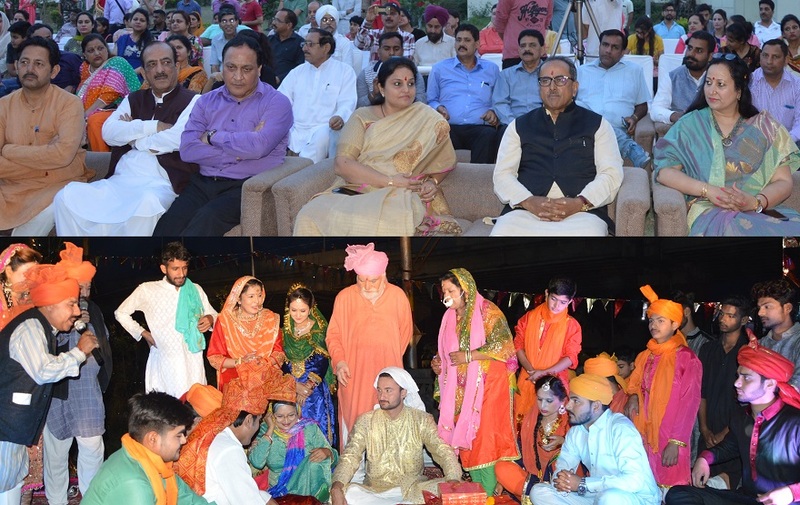 The traditional Dogra marriage and related functions were showcased in the programme besides a photo exhibition of S. K. Soi was also organized on the occasion. Deputy Chief Minister later distributed mementos among the participating artists as well as the artists.